Wed, Apr 17, 2019, 06:54 pm SL Time, ColomboPage News Desk, Sri Lanka. 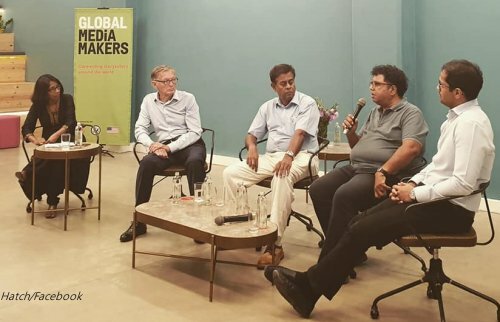 Apr 17, Colombo: The United State Embassy in Colombo said today that U.S. experts had joined four Sri Lankan film professionals in a panel discussion about how effective film distribution benefits Sri Lanka's movie industry, artists, and audiences on recently at Hatch, a workplace for entrepreneurs. Speaking at the event, U.S. Ambassador Alaina B. Teplitz said. "One of our core beliefs is freedom of speech, and movies are one of the most powerful ways that we can share our stories with each other. Strong and transparent laws that protect film distribution will ensure that Sri Lankan creatives will drive economic growth, are paid fairly, and can share Sri Lanka's stories with the world." Representing Film Independent, America's premiere organization for independent moviemaking, entertainment lawyer Michael Donaldson and Global Media Makers Senior Program Manager Shari Page emphasized how film distribution is a key channel for storytellers to reach their audiences. Moderated by Jaffna International Film Festival Director Anoma Rajakaruna, the panel included filmmaker Boodiee Keerthisena, a representative of Ceylon Theatres, and Chairman of Scope Cinemas Naveed Cader. Following the panel, participants and audience members gathered for a networking event at Commons Café. Film Independent is a non-profit organization aimed at helping filmmakers create movies, build audiences, and diversify the film industry. An expert on intellectual property rights laws, Mr. Donaldson is an award-winning author whose books on clearance and copyright are used in over 50 film schools. Ms. Page has worked as a casting associate and producer for over 27 productions including the Golden Globe winning series "Californication" for Showtime. Mr. Donaldson and Ms. Page are in Sri Lanka as part of the Global Media Makers program, an innovative mentoring initiative and cultural exchange program designed to foster relationships between American filmmakers and industry professionals with international social issue filmmakers. Filmmakers and other creatives can find out more about upcoming programs and connected to the U.S. Embassy by visiting the American Center in Colombo or following the Embassy social media sites: Embassy website, Facebook, Twitter, and YouTube.